^ "Christian I". lokalhistoriewiki. Retrieved June 1, 2018. ^ "Battle of Brunkeberg 1471". tripod.com. Retrieved June 1, 2018. ^ "Adolf VIII". Allgemeine Deutsche Biographie. Retrieved June 1, 2018. ^ "Dorothea, 1430-95, Dronning". Dansk biografisk Lexikon. Retrieved June 1, 2018. 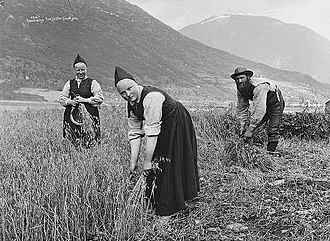 ^ "Karl Knutsson Bonde". lokalhistoriewiki. Retrieved June 1, 2018. ^ "Erik Axelsson Tott". Biografiskt lexikon för Finland 1. Svenska tiden. Retrieved June 1, 2018. ^ Christer Engstrand. 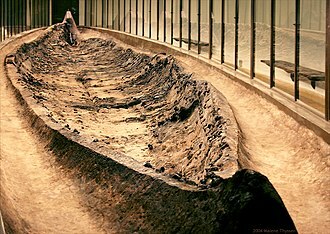 "Kettil Vasa (Karlsson)". historiska-personer.nu. Retrieved June 1, 2018. ^ "Jöns Bengtsson (Oxenstierna)". Svenskt biografiskt lexikon. Retrieved June 1, 2018. ^ Örjan Martinsson. "Sten Sture den äldre". Tacitus.nu. Retrieved June 1, 2018. ^ "House of Oldenburg". Almanach de Saxe Gotha. Retrieved June 1, 2018. John was a Scandinavian monarch under the Kalmar Union. He was King of Denmark, Norway and as John II Sweden, from 1482 to 1513, he was concurrently Duke of Schleswig and Holstein in joint rule with his brother Frederick. 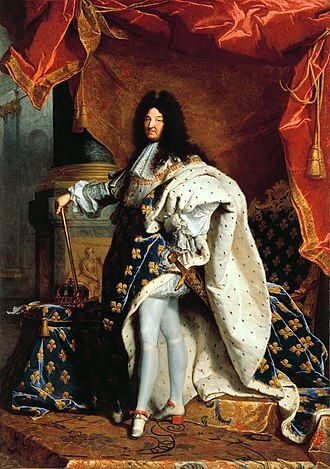 He currently remains the only King of Denmark since the century to not be named Christian or Frederick, if one does not include the current Queen of Denmark. The three most important political goals of King John were the restoration of the Kalmar Union, reduction of the dominance of the Hanseatic League, and the building of a strong Danish royal power. He was born at Aalborghus, in Aalborg, the son of Christian I of Denmark and Dorothea of Brandenburg, in 1478, he married Christina of Saxony, granddaughter of Frederick the Gentle of Saxony. This produced the following offspring, Christian II, Francis and Elisabeth, from about 1496 until 1512, he had a relationship with Edele Jernskjæg. In 1458, Johns father, King Christian I, had the Norwegian Council of the Realm commit to electing Christians eldest son as king of Norway upon his death. A similar declaration was made in Sweden, in 1467, John was hailed as successor to the throne in Denmark. 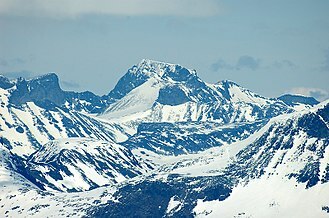 John used the title heir to the throne of Norway, in line with Norways old status as a hereditary kingdom, but this was a claim the Norwegian Council did not immediately recognise. Consequently, upon King Christians death in May 1481, Johns position was unchallenged in Denmark, whereas in Norway the Council of the Realm assumed royal authority, and an interregnum ensued. 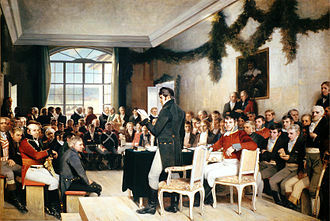 No serious rival candidates to the Norwegian throne existed, but the Council was determined to demonstrate Norways status as a sovereign kingdom. 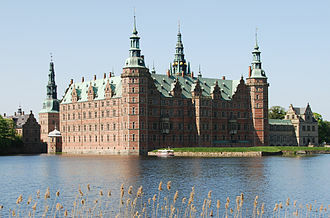 A meeting between the Councils of Denmark and Norway was appointed for 13 January 1483 at Halmstad, to work out the terms for electing John as king — his håndfæstning. The Swedish Council failed to turn up at the meeting, but the Norwegian and Danish councils proceeded to produce a joint declaration containing the terms for Johns rule and it was hoped that Sweden would accept the same document and thereby acknowledge John as king. Dorothea of Brandenburg was Queen consort of Denmark and Sweden two times each by marriage to Christopher of Bavaria and Christian I of Denmark. She served as regent during the interregnum in 1448. Dorothea was born in 1430 or 1431 to John, Margrave of Brandenburg-Kulmbach and she had two sisters, who became Marchioness of Mantua, and Elisabeth, who became Duchess of Pomerania. From about the age of eight, she lived in Bayreuth, were he father was ruler, the engagement was proclaimed prior to the application of Papal dispensation for affinity in February 1445, which was approved 10 March. On 12 September 1445, the ceremony was conducted between Christopher and Dorothea in Copenhagen, followed by the coronation of Dorothea as queen. 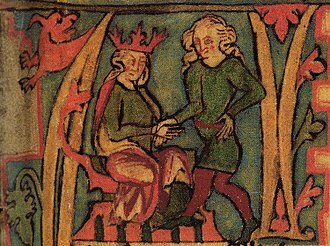 The King had financed it with a tax in all three Kingdoms, and the occasion is described as one of the most elaborate in Nordic Medieval history. On 15 September, she was granted dowers in all three Kingdoms, Ringsted and Skioldenses in Denmark, Jämtland in Norway, and Örebro, Närke and Värmland in Sweden. 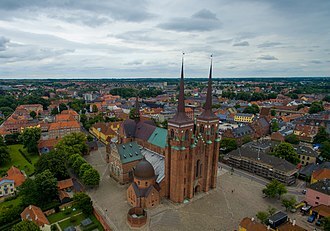 Should she chose to live outside of Scandinavia as a widow, she would instead be given a fortune of 45,000 Rhine guilders, Queen Dorothea left for Sweden with the King in January 1446, were they visited Vadstena Abbey and her dower Örebro. During this visit, she met her future antagonist Charles, Lord High Constable of Sweden, according to the chronicle Karlskrönikan, their meeting was a good one during which presented her and her ladies-in-waiting with many gifts. The couple returned to Denmark in September, the marriage between Dorothea and Christopher was politically favorable, her father governed Christophers German domain and was a loyal supporter and adviser. It did not result in any offspring and according to Ericus Olai, in January 1448, King Christopher died childless, which resulted in a succession crisis that immediately broke the Kalmar Union of the three Kingdoms. Queen dowager Dorothea, being the royal in Denmark, was proclaimed interim regent of Denmark until a new monarch could be elected. He was called Fortunatus as he was able to secure Delmenhorst for his branch of the Oldenburgs. Dietrich was the father of Christian I of Denmark, an ancestor to the present-day Danish throne under Margarethe II of Denmark as well as the last Czar of imperial Russia. He is the male line ancestor of Charles, Prince of Wales, Dietrich of Oldenburg was the son of Christian V of Oldenburg and his wife, Countess Agnes of Honstein. 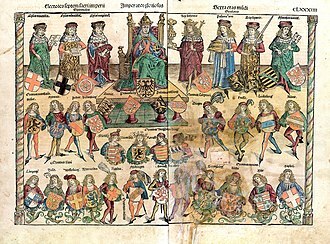 His grandfather, Conrad I of Oldenburg had left his lands divided between Dietrichs father and uncle, Conrad II, Dietrich’s father, Christian V, managed to gain the upper hand when Conrad IIs son Maurice II died in 1420. After this, most of the Oldenburg family patrimony was under the power of Dietrich’s branch, the house had several minor branches that had estates and claims, as was usual in any medieval fief. Dietrich of Oldenburg was the grandson of Ingeborg of Itzehoe, a Holstein princess who had married count Conrad I of Oldenburg. Since other legitimate descent from King Valdemar apparently was extinct by this time, Dietrich was considered the general of Kings Valdemar I of Sweden. Oldenburg or simply Oldenburg is an independent city in the state of Lower Saxony, Germany. During the French annexation in the wake of the Napoleonic war against Britain, the city is situated at the Rivers Hunte and Haaren, in the northwestern region between the cities of Bremen in the east and Groningen in the west. It has a population of 160,907, the city is the place of origin of the House of Oldenburg. Before the end of the German Empire, it was the administrative centre, archaeological finds point to a settlement dating back to the 8th century. 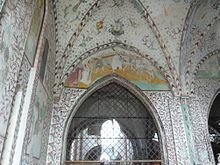 The place was first mentioned in 1108 as Aldenburg in connection with Elimar I who is now seen as the first count of Oldenburg. The town gained importance due to its location at a ford of the navigable Hunte river, Oldenburg became the capital of the County of Oldenburg, a small state in the shadow of the much more powerful Hanseatic city of Bremen. In the 17th century, Oldenburg was a town in a time of war and turmoil and its population. In 1667, the town was struck by a plague epidemic and, shortly after. The Danish kings, who were counts of Oldenburg at the time, were not much interested in the condition of the town and it was only that the destroyed buildings in the city were rebuilt in a neoclassicist style. The Grand Duchy now became the Free State of Oldenburg, with the city remaining the capital, in the 1928 city elections, the Nazi Party received 9. 8% of the vote, enough for a seat on the Oldenburg city council. 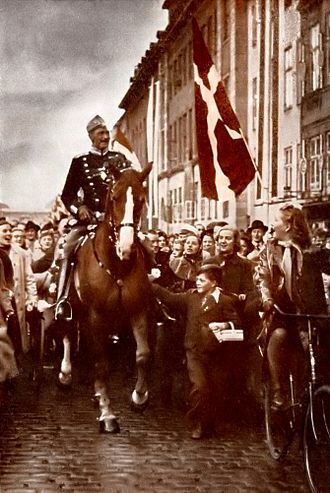 In the September 1930 Oldenburg state elections, the Nazi Partys share of the rose to 27. 3%, and on May 29,1932. By that autumn, a campaign of Aryanization began, forcing the sale of formerly Jewish-owed properties at steep discounts, in 1945, after World War II, the State of Oldenburg was part of the British zone of occupation. The British military government of the Oldenburg region resided in the city, several displaced persons camps were set up in the city that had suffered only 1. 4% destruction during the bombing campaigns of World War II. About 42,000 refugees migrated into Oldenburg, which raised the number of residents to over 100,000. 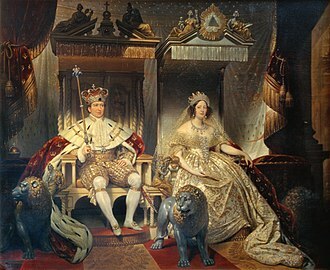 Anointing of King Christian VIII and Queen Caroline Amalie in 1840. Painting by Joseph-Désiré Court, 1841. Coronation of King Frederick II in St. Mary's Cathedral in Copenhagen in 1559. Anointing of King Christian V and Queen Charlotte Amalie at Frederiksborg Palace in 1671. King Haakon VII and Queen Maud of Norway in 1906. Theirs was the last Norwegian coronation, to date.